Unlike earlier games in the series, which cast the player in the role of a god influencing loyal followers, The Beginning took a radical departure and placed the player in the role of a shaman, who directly leads her tribe against opponents. Throughout the twenty-five missions of the campaign, the player leads their tribe across a solar system, dominating enemy tribes and tapping new sources of magic, with the ultimate goal of the shaman attaining godhood herself. 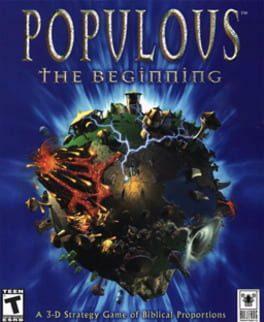 Populous: The Beginning was the first entry in the series to use true 3D computer graphics; Bullfrog waited four years after Populous II: Trials of the Olympian Gods so that the graphics technology could catch up to their vision for a new and different game in the series. The developers considered the addition of terrain deformation and manipulation, combined with "smart" villagers who automatically attended to tasks, to add an entirely new dimension to the series. The game's original title was Populous: The Third Coming before being changed prior to the beta release. Populous: The Beginning plays very differently from earlier titles and received mixed reviews. Reviewers positively noted the excellent graphics, while complaints were directed at the artificial intelligence and the indecision in game design between being a real time strategy title and a god game. GamePro's Peter Olafson wrote that Populous: The Beginning was not a bad game, in fact a good one; "but it's a different game—one without a quintessential quality that defined Populous." Populous: The Beginning is available from 5.69 to 5.69 from 1 shops.